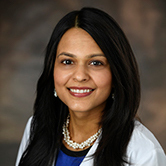 Monique Kumar, MD is board certified in pediatric dermatology and has an outstanding clinical and academic record that establishes her among the top physicians in her field. As a full-scholarship, 4.0 student at the Georgia Institute of Technology, she majored in pre-med and industrial & systems engineering, graduating with highest honors and earning an award as the top female in her engineering discipline as well as a Winston Churchill Scholarship for graduate study at the University of Cambridge in the United Kingdom. While at Cambridge, she earned a Master’s degree in genetics. She then moved back to the United States for medical school, earning her medical degree and completing her pediatric internship, dermatology residency (capping her service as Chief Resident) and advanced fellowship training all at the Washington University School of Medicine and its affiliated hospitals in St. Louis, Mo. Dr. Kumar is a noted researcher who has been published in numerous medical journals, and she has a special interest in acne, vascular lesions, genodermatosis and other general pediatric dermatology conditions. She enjoys interacting with young patients as well as helping train new dermatologists. She most recently served as an Assistant Professor of Dermatology at Emory University in Atlanta and won a global education grant from the International Society of Dermatology in 2013. Dr. Kumar has also served as a medical volunteer and faculty advisor for various youth programs.